1497. A severely constipated cat. What to do? 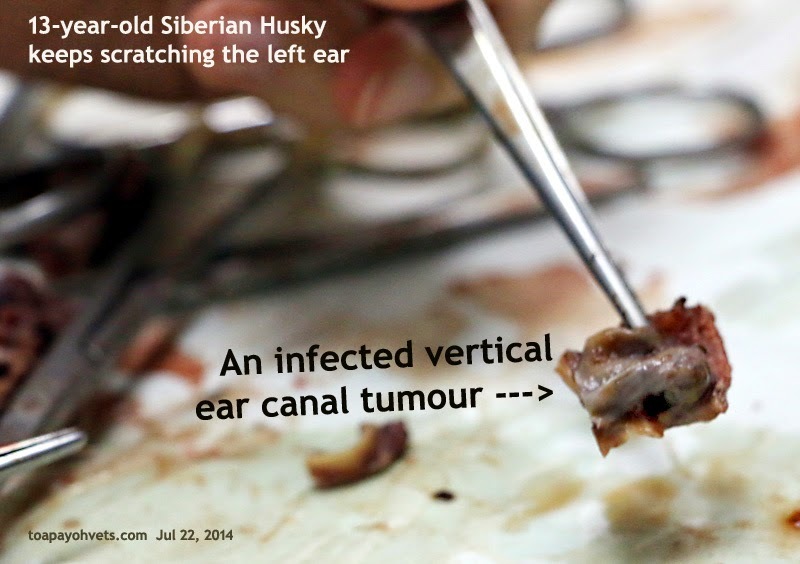 July 3, 2014 An uncommon case of a Siberian Husky with a growth on the top 1/3 of the vertical ear canal. The dog had been shaking his ear for the past 2 years. 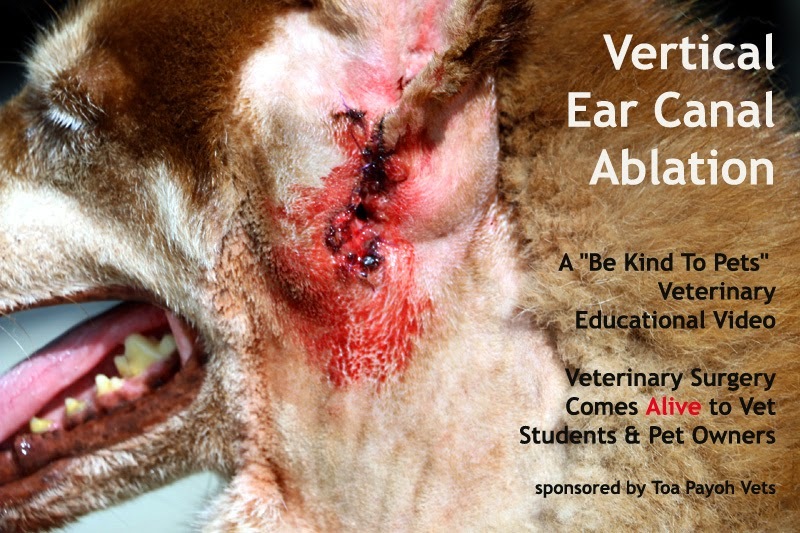 The family vet referred the owner to two other vet practices for a total ear canal ablation. He consulted me at Toa Payoh Vets. From my palpation of the vertical canal, there was pain and a hardened lump. Vertical ear canal resection (VECR) is the solution. In Dr Daniel's opinion, the smelly ear tumour in the top 1/3 of the vertical canal seen only during VECR surgery might be cut off. This is a difference in opinion as 10 vets would have differing opinions on how to handle this case. 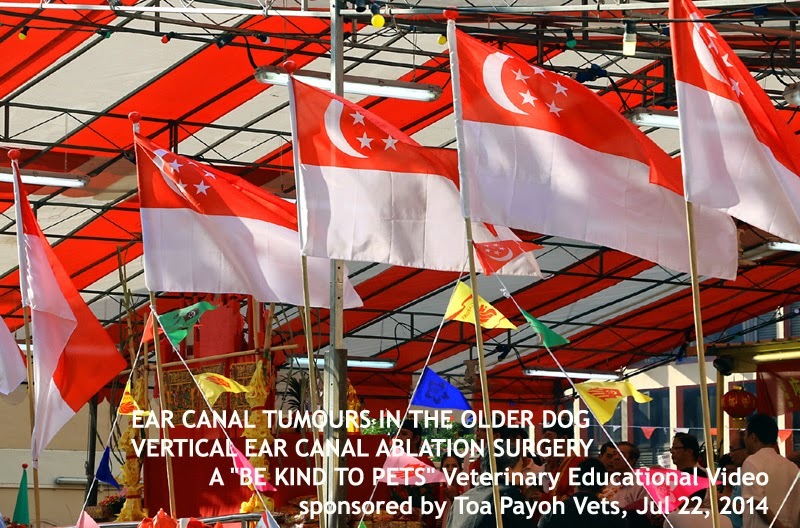 For example, the family vet advised total ear canal ablation and referred the owner to two other practices. To lower medical costs, no X-rays were done. During VECR, the tumour at the upper 1/3 of the vertical canal could be seen. It was around 3 cm x 3 cm and rotting. If it was excised, the other parts of the surrounding areas may erupt a recurring tumour assuming this was malignant. The better alternative is to excise the upper 2/3 of the vertical canal lessening the chance of recurrence. Not every vet will agree with me as this is part of the diversity of life and medical opinions in real life. I got Intern Shan to edit the video and in that way, she would understand what the operation was all about. The surgery images were quite confusing to her but she could understand after my illustrations. Once in a while I get to meet an intern much passionate in veterinary surgery. Shan would make a very good vet. It would take another 4 to 5 years to graduate. That would be 2019! High anaesthetic risks for a 13- year-old. Dr Daniel operated and removed the vertical ear canal. There was a big tumour at the top 1/3 of the vertical canal. It is hard to see inside the hairy vertical canal. The canal wall was hardened and painful. After medication for 2 weeks, 2/3 of the upper vertical canal is removed. The lower 1/3 was cut into two parts. One part was stitched downwards and the other part stitched upwards to allow the opening of the horizontal canal to drain out. The skin edges where the upper 2/3 of the veritcal canal had been excised were stitched. As at 1 month after surgery, the dog is OK. 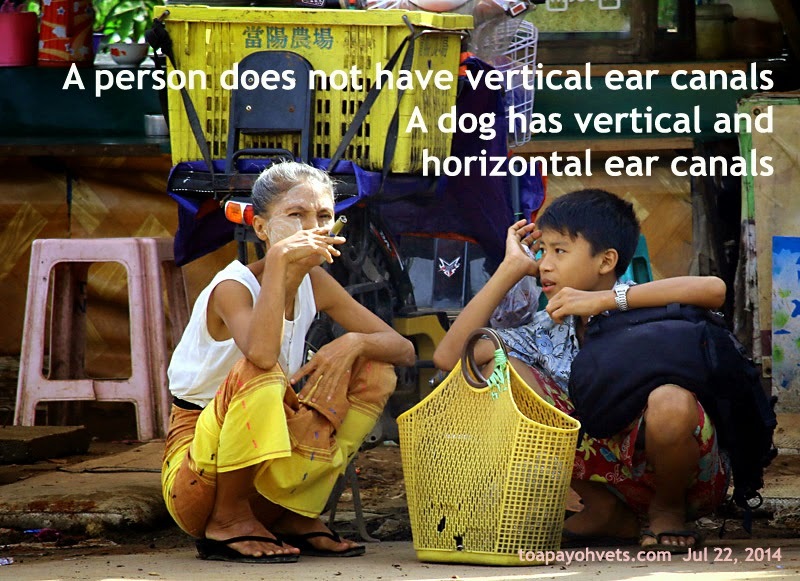 This surgery is called vertical ear canal ablation (VECR). There was a big rotten tumour in the upper 1/3 of the vertical canal causing pain and infection. Hence there was pus inside the ear canal for the past 2 years. There is another more common surgery called lateral ear canal resection (LECR). In this surgery, the side (latera) wall of the vertical canal is excised. It is an easier surgery. 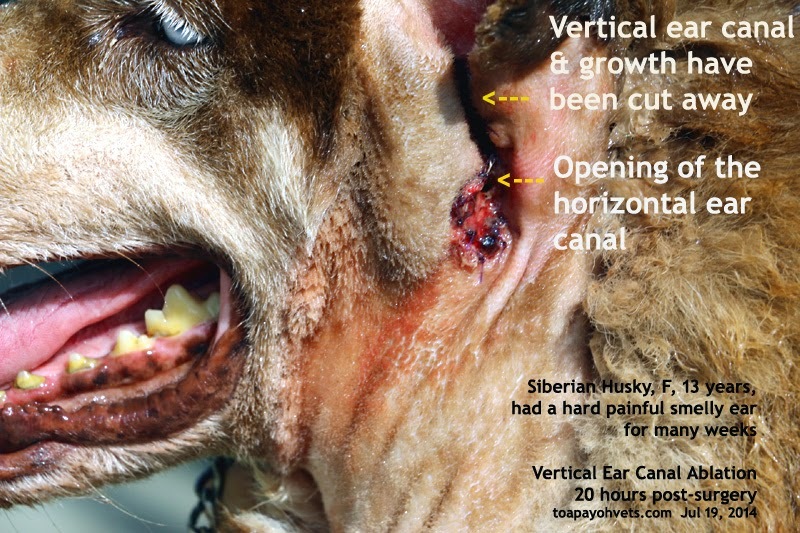 But this Husky had a tumour on the top 1/3 of the vertical canal and so it is best to do VECR in case the tumour recurs. Video was produced by Intern Shan who is very keen on veterinary medicine and surgery. She posted this video from her University in Australia into my "Dropbox" and I download it to my hard drive before uploading it to Youtube..
LEARNING EXPERIENCE. The illustrations were too distant to be viewed. My explanation of the stages of the surgery could have been zoomed in. I met the owner of the 13-year-old Siberian Husky this morning. The first vet referred him to two other practices as she does not perform the ear surgery. "Unable to examine the ear canal due to tumours." The owner had bad experiences with the first surgery recommended and did not go to the second. The dog's left ear was full of pus. The vertical canal was hardened and painful. The right ear was OK.
"What caused this ear problem?" he asked me. "Was it due to ticks?" 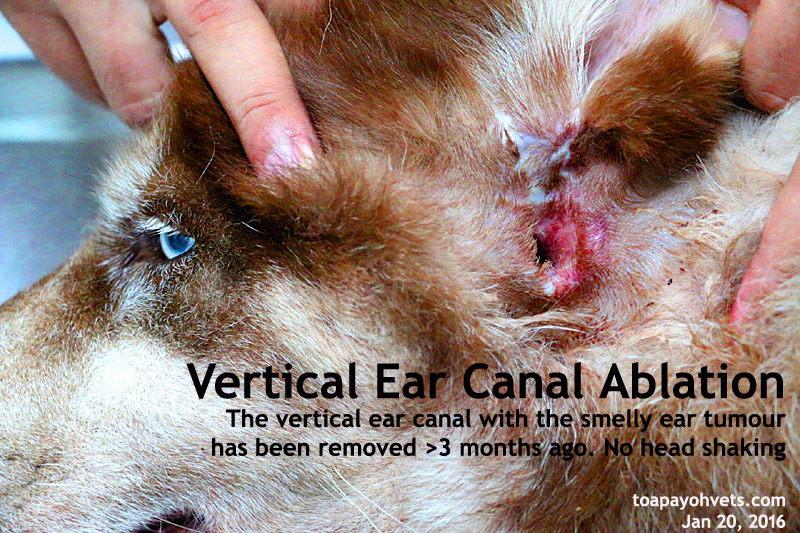 "It is usually a small ear infection and the owner ignores it over several months. So the bacteria and yeast cause inflammation and the vertical walls hardened like tumours." I pressed the canal and the gentle husky winced in pain. "Treatment would be surgery to take out the whole of the vertical canal," I said. "This dog is old and a blood test is needed." "My dog is healthy," he said. "You are likely healthy unlike an old man," I replied. "This dog is old and I don't know whether she has kidney or liver disease till a blood test is done." He agreed to a blood test and 2 weeks of drug treatment to bring down the inflammation. I will see the dog in 2 weeks' time and do the vertical ear canal surgery if the wounds have had healed. "The cost of surgery is $1,000 as it takes a long time and the dog is bigger in breed," I estimated the cost. It would be better if the owner had not delayed early ear infection treatment but he was overseas studying. Medical costs would be much less if there was no surgery. The young man really turned up for the surgery done on Jul 17, 2014. The 2/3 of the vertical canal with an abscessed cartilage tumour 3 cm x 3 cm x 1 cm were excised. Lots of bleeding. 20 hours later, the wound is washed. The dog went home with pain killers and antibiotics on Day 2 of surgery. Over 3 months after operation, the Husky came as he had severe diarrhoea. 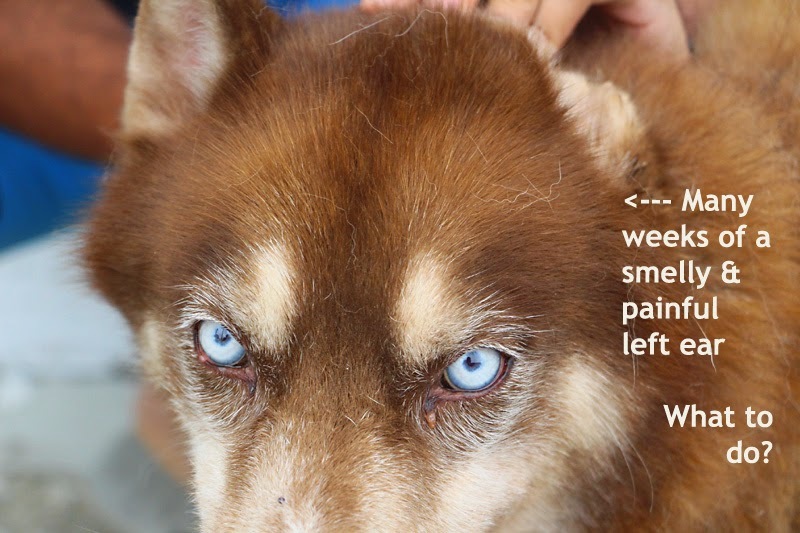 The Husky has not experienced any ear shaking or rubbing as the offending vertical ear canal had been cut away, together with the smelly canal tumour. The vertical canal right ear tumour, 2 cm x 1.5 cm x 0.7 cm, is compatible with ceruminous cystadenoma. It is not malignant. With old age, tumours appear in dogs. It is best to get tumours removed by your vet when they are small. 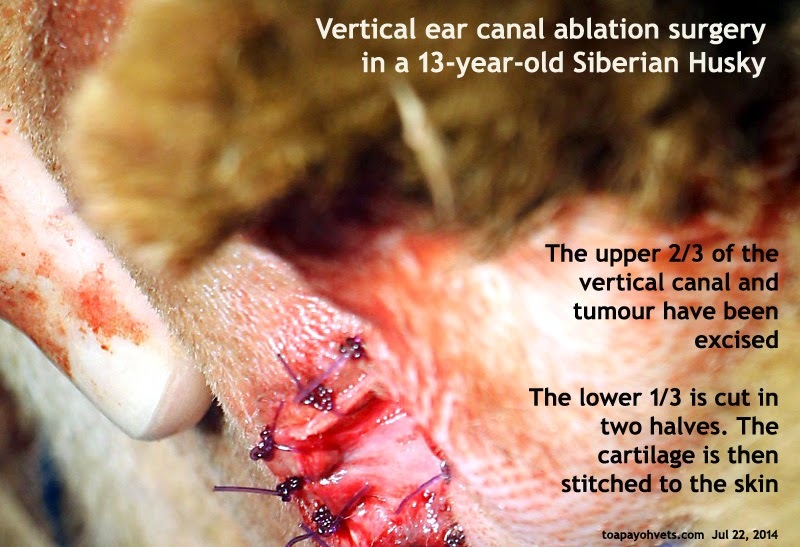 In this case, the large tumour was deep inside the vertical ear canal and was infected. The only solution was to excise the whole vertical ear canal. Some vets may not wish to perform such operations and will prescribe ear drops. These will not help to clear the ear infections as the tumour is traumatised by the dog rubbing and scratching the irritating ear.